January 3, 2018 / Guest / Comments Off on Should Systems Companies Sub-contract? With one or two exceptions, the operating model for most PVC-U systems companies is built on high volume at comparatively low margin. Going into the run-in to Brexit, that creates a number of challenges, because market fluctuation and uncertainty means capital investment is more difficult. “Regardless of how you voted, Brexit was always going to be accompanied by a period of uncertainty and we’re now seeing that. This summer there’s been a level of nervousness in our own markets but also housing, as well as a weakening of consumer confidence”, says Chris Byers, Managing Director Euroseal. He continues: “Interest rate rises also appear to be on the horizon, which may have bolstered the Pound but are unlikely to encourage householders to spend. Forecasts from industry pundits for the coming years are mixed to say the least. Having delivered a 1% increase in volume and 7% increase in installed value last year, the industry is overall for contraction through to 2020 (Palmer). But this is accompanied by forecasts of pockets of growth of up to 28% in some areas and contraction of as much as 13% next year, making prediction of volume, difficult. “Industry forecasts are highly variable but so are forecasts for the markets for building products with the future of new build resting on the effectiveness of government policy and retail, on consumer confidence and the housing market”, continues Byers. Byers argues that outsourcing existing profile extrusion to a trade extruder offers a ‘third way’, supporting systems companies in managing capacity effectively, flattening out peaks and troughs. It can also give them the capacity for new product development, without the overheads associated with large scale capital investment. This can often be on a sub-contract basis over an agreed period of time. 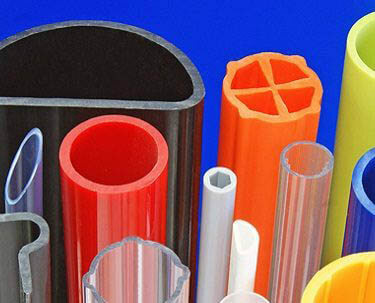 Euroseal has extensive experience in the manufacture of a diverse range of thermoplastic extrusions, including rigid profile and co-extrusions in PVC, wood composite, HDPE, Polystyrene, Polypropylene and ABS. With nine extrusion lines including five high capacity twin screw machines and four single screw machines, including co-extrusion, it operates one of the UK’s most advanced PVC-U extrusion facilities. This gives Euroseal the capacity to extrude profile from 40g to 6kg per metre and 0.7mm to 10mm thick, to exacting tolerances, with twin screws running to more than 200kg per hour, which means it also has capacity to manufacture a diverse product range. This includes construction products including curtain walling pressure plates, cladding; and electrical extrusions; automotive profiles; hygienic wall and ceiling profiles and garden decking. It’s the extrusion of window profiles and related ancillaries, however, where it specialises. This includes working to BSi Kitemark standards, providing a complete audit trail for every profile it extrudes. This includes printing bar length every 0.5m with the date, time, the machine it was extruded on and by which operative so that everything is auditable and transparent. It also operates a strict quality control process including LAB metre, monitoring of colour and reversion testing of profiles to a tolerance of 2%. It also has a freeze testing facility and shadowgraph overlay facility, which automatically checks dimensions of extruded profile against CAD drawings, guaranteeing accuracy of extrusion to minimum and maximum tolerances. Euroseal also offers design and CAD creation and manufacture of tooling, to extrusion, quality control, personalisation and packaging through to delivery. “Our systems company customers tend to use as an extension of their own facility. We may be a few miles down the road but the process is ultimately defined by them and theirs with full visibility of everything that we do”, says Byers. “It’s a way of meeting demand, particularly fluctuating demand, without tying up money in capacity that isn’t being used and also freeing up capacity to support continuing product development”, he concludes. For more information call 0121 344 4100 email sales@euroseal.co.uk or visit www.euroseal.co.uk.